The Pilot Acroball is a new line of pens from Pilot, one which I had never heard of prior to Mariko bringing me one back from Japan. I haven't been able to scrounge up too many details on this pen, other than the Acroball features a new oil-based ink developed by Pilot, which by all appearances makes this pen a direct competitor to the hugely popular Uni-Ball Jetstream line. And that was the first thing that came to mind when I started writing with this pen - "Oooh, this is just like a Jetstream". Like the Jetstream, the Acroball is a joy to write with. The lines are smooth, dark, and skip-free. There is really no resistance at all from the tip on the page. As minor as it sounds, I love the new grip design too. The herringbone like pattern gives the rubber grip a nice, non-slip feel. This pen falls into the workhorse category, like the Pilot G-2. Not a lot of bells and whistles, but it provides a comfortable, consistent writing experience. The Acroball is a winner in my book. I did not see any information on the Acroball on the Pilot US site, but the AU and UK sites had small hits. 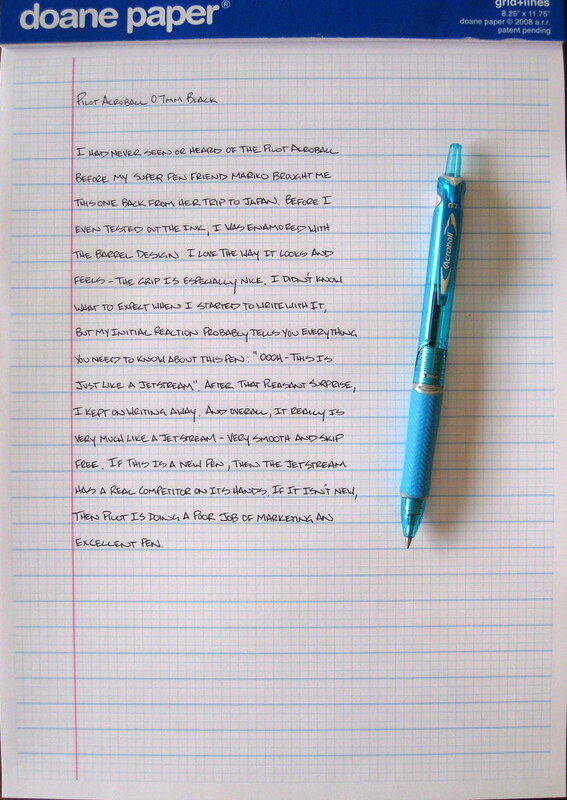 Pilot Pen Japan has the full details, which you can view through Google Translate right here. Posted on June 9, 2009 by Brad Dowdy.